At last! I actually started this in January, but since it's a personal project it got bumped back many times behind other customer's pieces. I gotta say it was worth the wait. I love this piece, I think this might be my new favorite. Of course I'm slightly biased with the subject matter (he does, after all, sleep on my bed) but I just am THRILLED with how this turned out and can't wait to wear it to some shows! This is one of those ones that you have to see in person. :-) There are 14 colors in this piece, and believe me when I tell you this was extremely challenging! Oh, and it's all dots. Oh my! That is so beautiful, and it looks like my old Timmy did some 40 years ago. Your artwork is amazing! That is incredible! Olin actually looks three-dimensional. You have quite a gift! Absolutely gorgeous! You never cease to amaze me!! Olin! What an amazing and great job you have done! Yeah, the subject matter affinity does help. Give the real Olin a hug for me! -BMc. 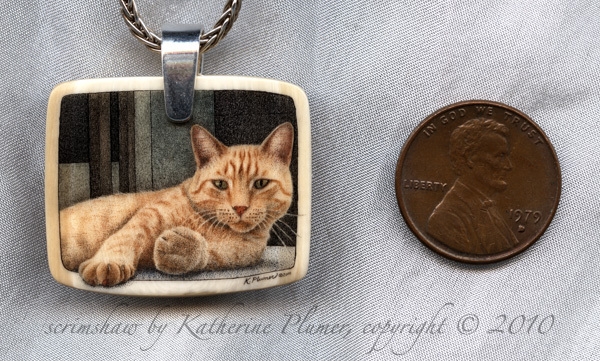 When I first glanced at that photo, I thought you had pasted a picture on a pendant as a joke! It's gorgeous!